Hydrangea 'Mini Mauvette' is a brand new colour to the species, with large mophead flowers in a deep mauve-violet. Blooms are held on very strong stems and appear early summer through fall. The dwarf habit of this native plant gives it great versatility in the landscape and the garden. 'Mini Mauvette' is very easy to grow. Since it only blooms on new wood you won’t have to worry about winter damage or pruning at the wrong time. The flowers dry well for use in the house or just left on the plant for winter interest. 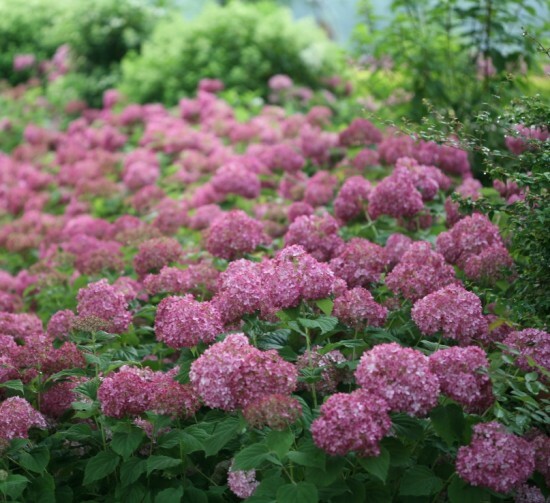 Due to its Smooth Hydrangea parentage, it tolerates heat and high humidity, and adapts to most soils. Plant in sun to part shade in average to rich soil. Although drought tolerant, for best performance keep it evenly moist. Smooth Hydrangeas should be pruned in early spring, just as the new growth begins to emerge on the stems. Cut the entire plant back by about one-third of its total height. This helps to build up a strong woody base while encouraging vigorous new growth with lots of flowers.